There are many reasons why directors should handle their "business", but not many know how. Most directors just want to direct and want to find their "savior" in their producers. It has taken me several books, documentaries, schools (The Los Angeles Film School's Producing Program and Full Sail University's Internet Marketing Program), film organizations (Film Independent) and countless conversations with colleagues, to get closer to making my films a reality as a producer and a director. On The Baby Cries I wore both hats, but collaborated with producer Kristen Wair during various stages of production. Handling a lot of the business in development and pre-production, gave me time to flesh out logistics, budgets and schedules. Strictly managing my own personal schedule also gave me an opportunity to prepare my work as a director. It was this balance that became crucial to making The Baby Cries (an original short film comedy). Art, business and collaboration are vitally important to making films. Even though I handled the business and creative aspects, there was still a lot to do to prepare for The Baby Cries shoot. As my mom says, "the hardest lessons to learn, comes from doing". To produce a film you are forced to understand the business mindset. You have to become entrepreneurial...that is if, you want your work to be seen. For a 14 page film that was I self financing, I really felt that I needed to control as much as possible while allowing key collaborators do what they are best at. There were some hard costs for production, and some costs that were deferred in order to make The Baby Cries a reality. Because there are no viable markets for short films, this endeavor was created as a calling card for myself and my collaborators. 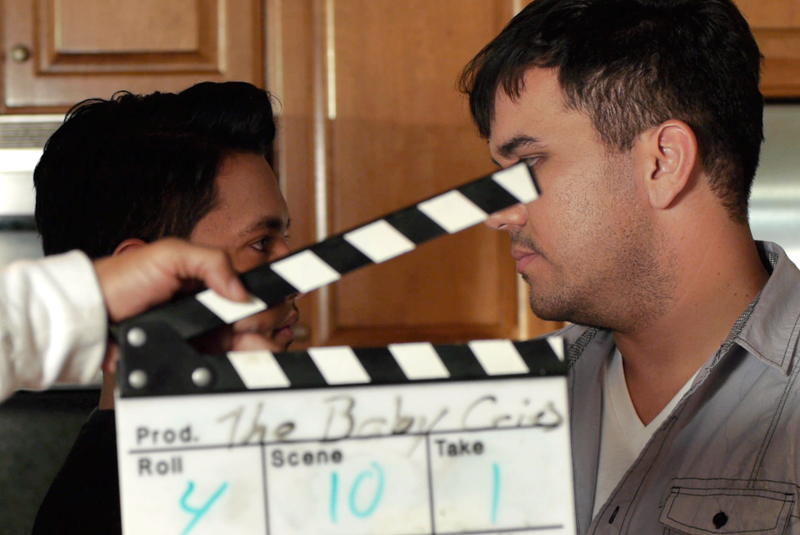 It also served as mock-up for feature film version and web series of The Baby Cries. A lot was at stake for me financially, but I really felt that this story was timely and important for an American audience. A story about a Gay couple parenting a child while trying to make amends with their estranged parents, mirrored a contemporary american experience. The story line intersected other aspects of society, age, culture, language, gender and faith, which are profoundly universal. So I knew that producing this first film was important to start a larger campaign for the bigger project. Many filmmakers had done this before, so I re-imagined what the possibilities could be for an original story I wrote. The Baby Cries reinforced the belief that you have to practice your art and commerce to get a handle of your work now and in the future. Like many other filmmakers I have countless ideas for films: drams, comedies, suspense and countless other genres, but none of this matters until a script and business plan are in place. Often times I run into cynics that tell me I am wrong for thinking about business or marketing, but my experience tells me my ventures have everything to with business, organization, collaboration, and most importantly, being a creative filmmaker and storyteller. On my shelf sit hours of video footage and old film gear that had not trajectory, no plan. I always joke that I studied producing so that I could direct. But it's true! Business forces you to trust people to collaborate with. People with your film's best interest. It is a venture built on relationships, so you trust in them, they have a trust in you, but ultimately the film. I have not worked with a better producer than myself, but even then, I acknowledge that I still have a lot to learn. What I do have is enthusiasm and heart, a business mindset as well as artistic spirit. Since my early days at Victor Valley High School, I have always brought groups of strangers together, whether it was drama club, band, television production class or just hanging out at Denny's with friends. I have always thought that the best adventure I could have was being on an adventure with friendly, funny, driven collaborative creative people. People think of a producer as the "person who handles money". That maybe part of the equation, but it is a small part of the job. It's making phones call to someone who is sick. It's taking someone out for lunch who doesn't have a dime. It's encouraging and motivating people who are having a difficult time. It is about "getting the money", schedules and budgets together. It's about being responsible for people on set and making sure they are safe and fed. This is an aspect of producing nobody ever really gets into, but investing in people is what it's all about. Without people I trust, I cannot make a movie. Believe me, I have shot plenty of times on my own, and working with people is a lot more fascinating. Filmmaking is a balancing act of the ABCs': Art, business and collaboration. Done well, filmmaking is a rich life experience with strangers that become family, and the work becomes part of a legacy of combined talents.